Here’s what I can tell you: Dale and I took off on a mini-break on Friday and headed for Cape Cod with really only one goal in mind. Yeah, that one. So we found the Bayside Resort – a lovely place (yes, we took the room with the jacuzzi) and spent the night there. It was really quite nice so we decided not to go out for dinner but rather found a pizza place nearby and brought it back to the room. I’ve never eaten pizza in a jacuzzi before but have to report that it was pretty cool. I’ve also never even pizza with champagne before, being more of a pizza and beer kinda gal, but frankly, it was not a bad combination! As for knitting, well, knitting in a jacuzzi would be great if it weren’t for the fear of getting hot water all over the knitting and thereby felting the knitting. So, while I really wanted a picture of me knitting in the jacuzzi for the blog, it just wasn’t meant to be. 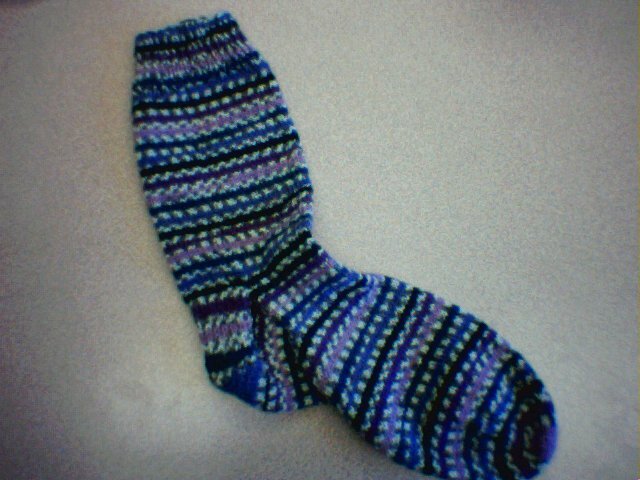 I did, however, finish the first of the regia sock set while on our mini-break. It’s quite lovely. See? Sunday, I had two goals in mind – start the second sock and start the Rosebud Cardigan baby sweater from Simple Knits for Cherished Babies. And I am quite pleased to report that I accomplished both of those knitting-related tasks. It was a beautiful afternoon and I sat on the deck and (mostly) knitted. There was a break or two for gardening and cooking dinner but I managed to meet my goals for the day. Truly an amazing feat. Monday we marched in the Lexington Patriot’s Day parade with the 25th MVI, our Civil War reenacting group. Along came the sock and I now have a new meaning for KIP – not knitting in public but rather knitting in parade. I sat on the side of the parade route while we waited to get going and happily knitted away. It was a gorgeous day and the cuff of the sock was finished by the time we got home. I worked on the baby sweater for a bit last night but was pretty beat from the day’s festivities! Too pooped to knit on!